In 1998, the CT State Legislature created the State Student Advisory Council on Education (SSACE) to give Connecticut students a voice in education planning and enable the state board of education, the commissioner of education, state department of education personnel, the governor, and state legislators to become familiar with high school students’ perspectives on key issues. 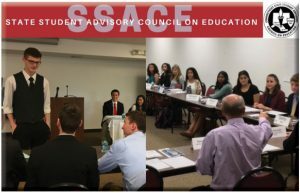 SSACE meets regularly with the education commissioner, and on occasion with the Governor, to reflect student opinion on matters of concern to the state’s high schools. The Council meets seven times per year. Members write position papers on important topics in education; conduct the statewide Challenge to Educational Citizenship Awards Program; and, through their discussions and activities, learn from each other about citizenship, leadership, and responsibility. For the past twenty years, SSACE has dedicated monthly meetings to influencing legislation and adapting it to the changing needs of Connecticut students. It has conducted action research recommendations on critical topics such as reducing the achievement gap, reforming standardized testing, and instituting programs promoting health and wellness.